Call of Cthulhu 7th is on the horizon- a game and system which has had many editions, but remains roughly the same game. CoC has to remain interesting in a time with many competing horror rpgs, including brethren Lovecraftian rpgs like Trail of Cthulhu, Cthulhutech, and Realms of Cthulhu. Call of Cthulhu kicked off horror gaming as a standalone genre. You could point to Tegel Manor as the first real haunted house product (maybe), but it doesn't put the horror elements at the center, and still focuses on the dungeon crawl. For this list I'm going to focus on products lines offering a full horror rpg. I'll subsume some interesting sub-products under their main entry (if they're produced by the same company). Some things, like S.H.A.D.O.W. over Scotland, offer a horror diversion or twist on the main system, but don't rise to the level of sourcebook or core rules. I'm sure I've left something off, feel free to add a line I missed (if published up through 1990). I've arranged these in chronological order by year. The big daddy of horror gaming. I remember when my sister first brought home the boxed set with the big blue book. I flipped through it, not really getting what the game was about. I'd only known Cthulhu and Lovecraft from the paperbacks with the terrifying covers on the shelves at the stores. Later, I'd eventually read August Derelth's The Trail of Cthulhu, in some ways the most grade-school of Mythos fiction. It scared me, but led me to read the real works, which really scared me. I was lucky that I had a patient sister who let me play in her CoC campaign even though I was a terrible player and a little kid who didn't get it. Robin Laws' suggests that CoC's notable for also being the first rpg to really emulate a literary genre. Sure we'd had fantasy games, but those wore the genre trappings rather than trying to act out a specific story form. History as setting, always vulnerable PCs, dangerous magic= CoC brought all of this to the table. It introduced Sanity as a mechanism, offering an abstract system representing non-physical damage- inflicting consequences and disadvantages. Many modern mechanics owe a debt to that. It is worth noting that Chaosium introduced two "sub-lines" for Call of Cthulhu in this period. 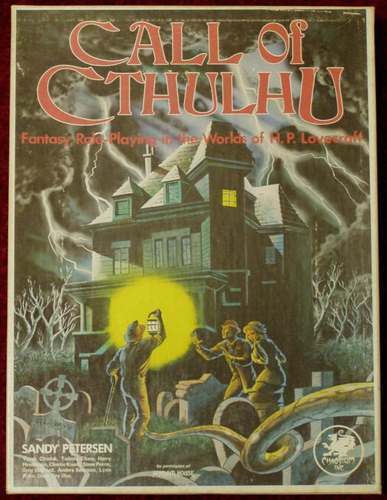 The first was Cthulhu by Gaslight in 1986, one of the earliest Victorian games. The second was Cthulhu Now in 1987 which tried to bring a modern spin on the ideas. Tri-Tac produces some of my favorite rpgs that gamers have never heard of (this, Fringeworthy, FTL: 2448). Again I first saw this game through my sister's purchase- she'd picked up a copy a con. I loved reading through it because it took the horror with a strong dose of humor. It remained a game about monsters, the occult, and the supernatural but it also added some sly in-jokes. The Evil Dead might be a good reference point. 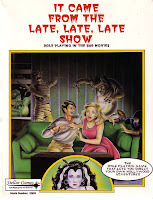 Stalking the Night Fantastic would eventually shift to be called Bureau 13, go through several editions and add even more humor (complete with a Foglio cover). It was the first horror game to suggest a federal agency of clearinghouse for dealing with the supernatural and strange (anticipating The X-Files...). I'll honestly say that two things kept me away from Chill when it came out: the goofiness of other Pacesetter publications and the Holloway cover. I knew it was a horror game, but from the outside, it looked to be just hanging on Call of Cthulhu's coattails. It took a broader approach to horror- covering all of the classics. Many reviews suggested the original rules focused more on fighting monsters than offering horror or frights. For a nuanced perspective on this, see James Maliszewski's retrospective here. I like the idea that Chill serves as a middle ground between D&D and CoC. I offers the concept of a patron organization, S.A.V.E, independent of conventional authority. Chill would see a rebirth with Mayfair's new edition in 1990. It was rumored that another version would be coming out a few years ago from OtherWorld Creations, but I'm not sure of the status of that. I loved the Ghostbusters movie. Within a week of seeing it I was trying to figure out how to put together a game based on it. I ripped apart Stalking the Night Fantastic and created a crazy and highly detailed system. It didn't work for some reason. I couldn't figure out what the problem was- why I couldn't get the feel I wanted. Then the Ghostbusters rpg came out and I went 'd'uh.' This was probably the first rule-light game that I really got. I'd seen some others, but they felt thin to me. This game actually emulated the genre and narrow setting. In that regard it changed the way I thought about games. It was fun and clever, with the horror taking a back-seat as it needed to. It remains among the best "funny" games out there- striking the right balance between goofiness and playability. This book shifted how our group saw GURPS. We'd used mostly for some fantasy game up until that point. Once we read this and got the idea of the fright check, we ran a lot more horror: pulp, modern, Lovecraftian, etc. We liked the relatively normal level of the characters combined with the ability to build the character you wanted. Our group liked that control. The combat system also lent itself to the danger and speed of horror games, as opposed to other generics like Hero System. GURPS Horror also codified horror as a "genre"- a form of role-playing and a kind of game which could be examined and explained. 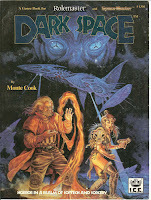 Like many GURPS books it has gone through many editions and variations. For a really good look at the first edition check out Eric Aldrich's review. I've never been a Palladium guy, although I've seen it enthusiastically supported by many in our area. In some ways it was a logical extension of the brand- a reskinning of the basic system with modern horror trappings. I've heard it brought many innovations to the Palladium system, but I'm how much it pushed horror gaming in general forward. It is worth noting how much the Megaverse incorporates classic horror elements: zombies, nightmarish creatures, territories of darkness. The adventure sourcebook for BtS, Boxed Nightmares, had a great cover which made me pick that up for use in other games. While it only marginally belongs on this list, it is looking at how Realm of Chaos (and its later partner Realm of Chaos: The Lost and the Damned) brought horror to the tabletop. RoS has some WHFRP materials in it, but more important is the tone it brings. Chaos in the WH is awful- Lovecraftian scope meets Heavy Metal sensibilities. It is over the top, corrupting, pus-filled, and mutated. It is not subtle- which makes it perhaps the perfect form of horror to smash up against classic fantasy gaming. Here the approaches of traditional dungeon explorers and adventurers leading to death by drowning in offal and effluvium. It is Barker and Splatterpunk vs. Lovecraft and Literary Nihilism. The connection can be seen in GW's The Enemy Within campaign which, at least at the start, feels like a Call of Cthulhu game. These books seem like a reaction to that- a need to dial things up to 11. A game which aims to emulate horror movies...mostly bad horror movies. Slasher films, 50's B Movies, Teen Monsters, and so on. It is a relatively light and goofy game, but one which has seen several editions since it first came out from Stellar Games. There's a fame mechanic which allows for meta-concepts like more famous characters (actors) having access to better props. Like Ghostbusters it aims to emulate a narrow form of horror. I've had a hard time tracking down specifics on the earliest editions of this game. It came out in 1990, but I had no memory of it at all. 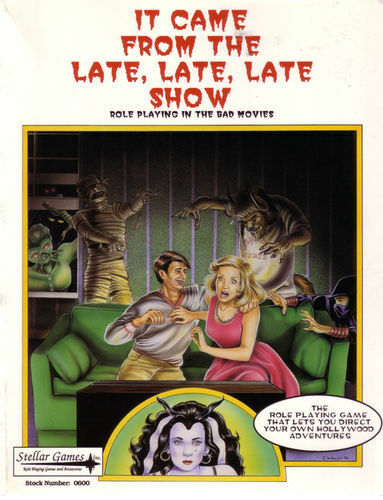 The reviews and discussions suggest that it was a more brutal and visceral horror game, drawing from Clive Barker, Hammer films, and The Evil Dead. Players take the role of ordinary people thrust into terrible and deadly situations. In some ways Blood! anticipates the shift to more brutal horror games from White Wolf and Black Dog. We'd see more and more of those games in the 1990's, focusing on visual gore over psychological and existential terror. The first rpg to focus on players taking on the roles of monsters in a modern world. It anticipates Vampire: The Masquerade, but despite having several editions and supplements, it paled in comparison to that slightly later game. The PCs take the roles of different monsters, broken into kin types, living beneath NY. They hunt and are hunter by other nightmares, but their lives focus on style, fashion, and music. It is weird to see how close the concerns of this game parallel VtM. I think it show the rise of a certain kind of youth and goth culture and the mixing of geek genres going on at the time. I was surprised to see how early this product came out. I'd pictured it arriving several years later after we'd started to see other genre mash-ups like Dark Conspiracy and GURPS Cthulhupunk. Dark Space is a campaign sourcebook for Space Master, the sci-fi version of Rolemaster. It has living ships, biotech, corrupting psychic powers, and monstrous society of Elder Gods and overlords. It feels like someone ran a really dark campaign of Spelljammer (released in 1989) and decided to write it up. It mashes together those ideas with Lovecratian themes. It is also written by Monte Cook and is one of his earliest published credits. This supplement, drawing loosely from the earlier Ravenloft modules, attempts to bring horror to the AD&D system. Smartly it focuses on kinds of horror which will work in that context- "gothic" horror in the most classic sense. This boxed set began a line of material and several different iterations, including a "Gothic Earth" which would apply the AD&D systems to an alternate Victorian-era Earth. This supplement remains more conventionally fantastic, with a demiplane of horror which the PCs can wander into. The later Ravenloft Campaign Setting would expand this further to make the Ravenloft setting a solid and serious place to run a fantasy campaign. Ravenloft's interesting because it was well-done, influential, and showed a willingness on the part of TSR to expand their core franchise into genres others had shown were viable. The new edition of Chill is stone dead, sadly. The people behind it were talkers, not doers. At least that was the impression I got from being on the play test list. I even got some play testing feedback posted, but even though it was greeted warmly since "we're going to print next week" (paraphrased) nothing happened. Too bad, since it had a few good ideas. What always struck me about Chill between the Pacesetter and Mayfair editions was the radical shift in art style. They went from a kind of classic, almost D&D house style to a completely new approach- informed by Bill Sienkiewicz and the new Vertigo art styles. Mayfair did an excellent job of rebranding the game that way. They did. I thought it looked very weird, which was kind of fitting in its unsettling way. I will always think well of West End Games. I *still* think that both their original and 2nd edition Star Wars Roleplaying Games were the finest, simplest, most elegant and idiot-proof game ever written. 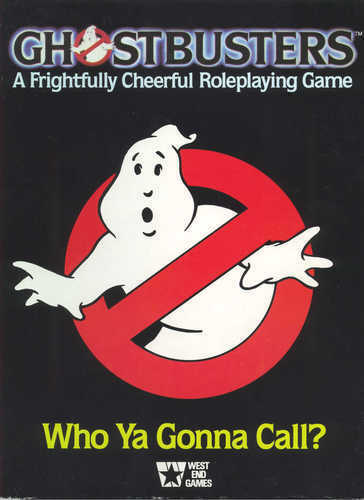 I can't remember but wasn't their Ghostbusters game an iteration of a single rules system they also used for their Indiana Jones and also some other 'setting' I remember that involve roleplaying pulp-horror style adventures. "Blood"-something? Like "Bloodhunt" or "Bloodtales"? I agree completely: WEG's Star Wars was utterly brilliant, both as a game and in the way it delivered its setting. Ghostbusters was actually an early iteration of that d6 system, and Masterbook an extension of it into other settings. It worked well across the board--probably the best high-adventure RPG system I've ever seen. I always think of the British show "The Avengers" as prefiguring the X-files, albeit without the conspiracies. A lot of their investigations uncovered really weird stuff, with a focus more on superscience than the supernatural. @Jeremy C: Ghostbusters was the prototype of that d6 system. I'm not entirely sure, but I believe that WEG's "Masterbook" system used a variation of that (which included many licensed games). The rpg you're thinking of is World of Bloodshadows. I left that off the list as it seemed much more pulp and adventure than horror, but I could be wrong. @Starwed: That's an interesting connection I hadn't made. For sheer bureaucratic agency problems, I've been thinking that there's a spiritual connection between The Sandbaggers and The X-Files. Wow, I never knew about a lot of these games. Thanks for a walk down History Lane! I remember reading Nightlife and really liking it but finding nobody who ever wanted to give it a go. Of course I didn't find it until after V:TM had already came out so people around here just wanted to play that instead. I think Nightlife really took a hit because it was done by a small press with a kind of crappy presentation. I remember seeing many of those Stellar Games products in distributors' junk and discount bins for years. White Wolf smart set the bar high for game appearance and aesthetics.